PROVIDENCE, RI- Mayor Jorge Elorza, Commissioner of Public Safety Steven M. Paré, Training Academy Director Captain Anthony Lancellotti and members of the Providence Fire Department gathered this morning at 150 Niantic Avenue to welcome 80 new recruits as they began their first day of the Providence Fire Department’s 52nd Training Academy. The new class is comprised of 7 (8.8 %) females and 73 (91.2%) males. There is a composition of 36.3% minorities and 27 recruits are proficient in a language other than English, including Spanish, Yoruba, Cape Verdean, Portuguese, Haitian Creole, Cambodian, Laotian and American Sign Language. 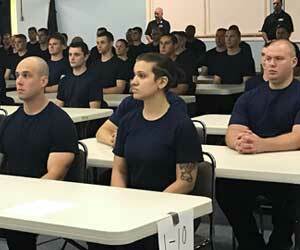 28 recruits are Providence residents and 8 have served in the military. These 80 individuals were selected for the 52nd academy following a rigorous testing process and will now undergo 22 weeks of training, ensuring that they obtain the tools, skills and resources necessary to become a sworn member of one of the busiest fire departments in the country.